On Sale Now! Free Shipping Included! 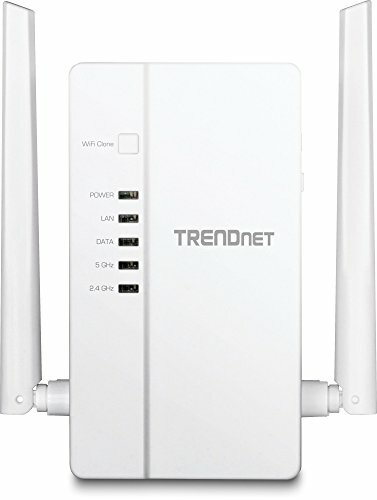 Save 6% on the TRENDnet Wi-Fi Everywhere Powerline 1200 AV2 Dual-Band AC1200 Wireless Access Point, 3 x Gigabit Ports, TPL-430AP by TRENDnet at AABX. MPN: TPL-430AP. Hurry! Limited time offer. Offer valid only while supplies last. TRENDnet’s WiFi Everywhere™ Powerline 1200 AV2 Access Point, model TPL-430AP, uses an electrical outlet to create or expand a wireless network. TRENDnet’s WiFi Everywhere™ Powerline 1200 AV2 Access Point, model TPL-430AP, uses an electrical outlet to create or expand a wireless network. Two Powerline adapters are needed to start a network. Connect one Powerline adapter to the router, and plug the TPL-430AP into a power outlet in another room where WiFi connectivity is needed. The WiFi Clone feature conveniently copies your existing wireless network settings to the TPL-430AP for faster network integration. Three gigabit ports provide high-speed network connections to devices, and a 6 Gbps switching capacity allows data traffic to flow smoothly, reducing traffic bottlenecks. Connect all of your 2.4 GHz & 5 GHz devices to a dual band WiFi AC1200 network. Use your router’s WPS button and the TPL-430AP’s WiFi Clone button to conveniently copy your existing wireless network name and password for quick network integration. Powerline 1200 networking over existing electrical lines. Enhanced Powerline performance and range from MIMO with Beamforming technology. Easy installation - TRENDnet adapters auto-connect out of the box.